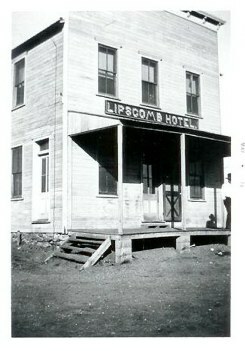 The Hotel Frame Shop is located west of the Courthouse in the old Lipscomb Hotel that was moved to Lipscomb in 1886. It was called the Gilbert Hotel later to be bought by John Theisen in 1908 and run as a hotel. It was eighty feet long and two stories until after the war when the top floor and back 40 feet were sold to the Cowan's to be used to build corrals and barns. In 1996 Jan Luna bought the old hotel from Hobbie Mingus to become Foxhole Frames. Jan studied to become a Certified Picture Framer (CPF) and received her certification in Dallas, Texas. Shed renewed her certification five years later in Orlando, Fl. Her qualification as an "archival framer" has allowed her to do a lot of work for Amarillo Museum of Art. The Hotel Frame Shop is a custom frame shop that offers over 500 moulding samples and several hundred choices of matts and fillets. Customers have the option of choosing frames ranging from under $50 to over several hundred for hand rubbed Italian moulding. The Hotel Frame Shop is open by appointment by calling 806-862-6300 or catching Jan around town on Wed after 2:00pm. After all...it's Lipscomb! Most folks know she's somewhere around town working on a project.